Host Eleanor Bobrow welcomes physician, educator and patient advocate Dr. Melissa Clarke to the program. 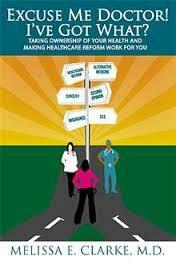 She’s written a book call Excuse Me, Doctor, I've Got What, The Complete Guide to Taking Ownership of Your Health and Making Health-Care Reform Work for You. In addition to practical, how-to guidance on everything from choosing a doctor to navigating insurance, Excuse Me, Doctor equips the reader with a self-health action plan to be our best advocate in taking care of our most valuable resource-our health.